Certainty of Terms – the promises of the parties must be clear. It must be clear from the business agreement the promises that each party is making. Without some description of the terms and conditions of the parties, a court will be unable to enforce the business contract against either party. 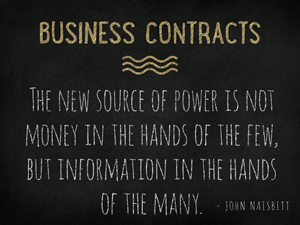 Our Chicago business lawyers call this type of contract an illusory business contract. An illusory contract is most often between two parties whereby one party making the promise to perform is under no obligation to fulfill the promise and thus the contract is unenforceable against said party. The terms and conditions of the business contract must be sufficiently definite to allow for the business agreement to be enforced. A business contract in Chicago, Illinois, like any agreement, is an exchange of promises that the law will enforce, or a writing which contains certain terms and conditions to which the parties have agreed. An enforceable business contract will generally include the following elements: offer, acceptance, consideration, intent to be bound, legal purpose, capacity, mutual asset, and certainty of terms. A governing law or choice of law provision specifies that an agreed upon jurisdiction, such as Illinois, will govern the enforcement of the business contract and the interpretation of its terms. A venue provision or forum selection clause, such as the Circuit Court in Cook County, Chicago, Illinois, determines the actual place of business litigation in the event that a contract dispute arises under the business contract. The general rule in Illinois is that each party to a contract dispute, such a Chicago breach of contract matter, must pay his or her or its (if a limited liability company, corporation or partnership) own costs and attorneys’ fees, absent statutory or contractual authority that would require one party to pay its fees and also reimburse the other party for its fees too. Most frequently in the form of a prevailing party provision, a business contract can provide for recovery of the prevailing party’s attorney fees (and other costs, such as court costs and the cost of other professionals) from the losing party. To that end, parties should be wary of one-sided clauses, as courts may hold such provisions unenforceable, depending on the situation and circumstances of the parties. However, prevailing party provisions may be appropriate depending on the nature of the underlying agreement (noncompete agreement, confidentiality agreement, or other one-sided business contract). A merger or entire agreement clause provides that the written business contract represents the complete and final agreement between the parties with respect to the subject matter contained in said agreement. These provisions are designed to reinforce the parol evidence rule (preventing a party to an executed business contract from introducing evidence of prior oral agreements that occurred before the business contract was executed in order to alter the terms of the final business agreement) and establish that any prior negotiations and terms are superseded by the written business contract. A severability clause provides that should a court deem any provision in the contract unenforceable, the parties agree that all remaining contract provisions remain operative and enforceable. In some contract situations, business lawyers may also empower the court to ascertain the intent of the parties and revise the unenforceable provision (or “blue pencil”) to the extent necessary to align with applicable law. An alternative dispute resolution provision allows the parties to specify a method to resolve any contract disputes outside of the formal commercial litigation process, such as good-faith negotiation between the parties, mediation, arbitration, or a combination of the aforementioned. While there is a lot of information out there stating that mediation and arbitration allow for faster and less expensive resolution of contract disputes, this is not always the case. It is very much dependent on the circumstances of the business contract and the parties’ preference. An interpretation clause allows the parties to clarify how the provisions of a contract should be read and interpreted. It should be noted that the parties may specify that a court is not to apply the general rules of contract construction that ambiguities be resolved in favor of the non-drafting party. This is appropriate when the parties have negotiated the business contract at arms-length, have had ample opportunity to review the business contract, and have engaged corporate lawyers advise in the contract drafting process. If the parties cannot execute the business contract in-person, in the same location, the counterparts clause allows the parties to execute separate signature pages, which for all purposes will act as a single document. In addition, counterparts provision allows the parties to execute the business contract electronically and provide for enforceability of the signatures (and the business contract) sent by PDF. Our Chicago contract lawyers have significant experience in handling a wide range of business contracts in a diverse number of business industries. To schedule a consultation with one of our contract lawyers today, please contact us online or give us a call at 312-789-5676.